Opposition parties have urged the Hawks to re-open the probe into the multibillion-rand arms deal after new bribery claims emerged. General Anwa Dramat (left), head of the directorate of priority crimes (the Hawks), should now re-open the investigation into the arms deal and investigate the claim that R24-million was transferred to a South African consultant by BAE Systems, Democratic Alliance spokesperson David Maynier said. 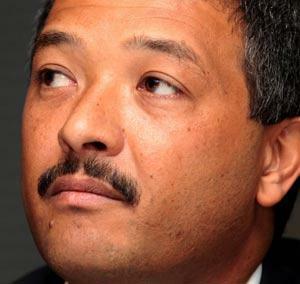 On Thursday, Saab chief executive officer Hakan Buskhe issued a press statement admitting that an internal investigation had revealed that about R24-million had been paid by BAE Systems to Sanip Pty Ltd, he said in a statement. While the payments were then transferred from Sanip to a South African consultant, the transactions were never entered into Sanip's accounts, and the payments took place without the knowledge of Saab. "The consultant who received the secret payments is reportedly Fana Hlongwana, who was an adviser to former Minister of Defence Joe Modise, and who was alleged to have received up to R200-million in commissions relating to the acquisition of 26 Gripen fighter jets from Saab/British Aerospace," Maynier said. The information revealed by Buskhe was very serious, he said. It amounted to a prima facie case of bribery and/or corruption in respect of the arms deal and should be investigated. "If the payments were above board, why was it necessary to launder the money through Sanip, a company which was reportedly set up by Saab/British Aerospace to manage the arms deal offsets?" "The DA will therefore be writing to General Anwa Dramat, head of the Hawks, to confirm that the Hawks will be investigating the R24-million payment reportedly made to Fana Hlongwana by BAE Systems," Maynier said. In another statement, Freedom Front Plus leader Pieter Groenewald said the "fact that Saab has now acknowledged that it had paid a bribe in the arms acquisition transaction with South Africa, and that names are being mentioned, should have the result of an immediate investigation by the Hawks".